Israel’s latest settlement drive confirms its leaders have no intention of making a concession on Palestinian statehood to Abbas. With Israel and Hamas locked in military stalemate after their 50-day confrontation in Gaza, attention had returned to reviving a peace process between Israel and Palestinian president Mahmoud Abbas. That is the context for assessing Israel’s decision to antagonise all its main partners against Hamas – the United States, Europe, Egypt, Jordan and, in practice, Abbas’ Palestinian Authority – by announcing plans this week for the biggest land grab in the West Bank in three decades. In normal circumstances, this would look like an example of shooting oneself in the foot. But, as Israeli analyst Jeff Halper pointed out, Israel rarely abides by normal rules. Yesterday, US secretary of state John Kerry phoned Israeli Prime Minister Benjamin Netanyahu, reportedly to demand he reverse his decision. Barack Obama’s administration is said to have been angered not only by the decision itself – which seized 1,000 acres of Palestinian land near Bethlehem – but by Israel’s failure even to warn it in advance. Israeli analysts have noted that the clash over the land expropriation – intended to build a fifth West Bank city for settlers, called Gvaot, south of Jerusalem – marks yet another downturn in increasingly fraught relations between Israel and Washington. “This is a major embarrassment to the US. There it is trying to coax Abbas back into negotiations while Israel blatantly undermines its efforts,” Halper told Middle East Eye. Israeli officials have tried to play down the seizure as nothing more than a technicality, though it has not helped their justifications that the move’s timing has been widely presented as “revenge” for the murder in June of three Israeli teenagers in a location close by in the West Bank. Officials argue that Palestinians have no private claims on the land; that it is part of the Gush Etzion settlement bloc, which, they claim, will be awarded to Israel in a final peace agreement; and that the area has long been earmarked for Israeli settlement. 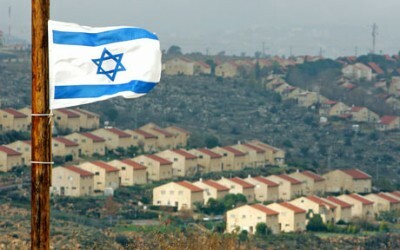 In addition to Israel’s violation of international law in seizing the land, observers note that there are already five Palestinian communities there, and that the new settlement will contribute to Jerusalem’s encirclement, sealing it off from the West Bank and further damaging the prospects of a viable Palestinian state emerging. Yesterday, Dror Etkes, an expert on the settlements for the Israeli peace organisation Peace Now, noted that the swath of land would create a territorial corridor between Israel and the Gush Etzion bloc. Nearly a fifth of the expropriated land actually lies beyond Israel’s separation barrier, sometimes assumed to be the demarcation of its territorial acquisitiveness. Daniel Seidemann, a Jerusalem lawyer who specialises in land issues, told Middle East Eye that this latest decision was payback for the settlers, who had helped Netanyahu during the seven weeks of Operation Protective Edge by not opening up another front with the international community. In many ways, Washington’s opposition to this move echoes its anger at Netanyahu’s attempt in late 2012 to annex the so-called E1 area, west of Jerusalem, which also threatened to cut off Jerusalem from its Palestinian hinterland. It remains to be seen whether US pressure will force a climbdown this time from Netanyahu, as it eventually did when he agreed to “delay” his E1 plans. But whatever the final decision, the reality is that plans for encircling Jerusalem are constantly on the drawing board, and are making slow, incremental progress, as a report by the International Crisis Group revealed. Israeli leaders simply seek the best moment to try to browbeat Washington into submission on any particular component of the plan. Netanyahu’s reasons for taking on the US now are likely to be complex. Not least in his calculations, he needs to show an achievement in the West Bank to answer the many domestic critics of his performance in Gaza. His popularity has plummeted since he signed a ceasefire agreement. A majority of the Israeli public, and especially his supporters on the right, expected him to crush Hamas, not to negotiate terms with it. He has also been under fire from government coalition rivals further to the right, such as Avigdor Lieberman and Naftali Bennett, who have implied not so subtly that he demonstrated weakness in Gaza. The crisis he has now provoked is undoubtedly designed to deflect a little the attention of the Israeli public and media from what are seen as his failures in Gaza and show that he is playing hardball with the Palestinians. But possibly even more useful, Netanyahu has engineered a confrontation with the US that will remind the Israeli public of the international climate within which he must work, both in relation to Gaza and the West Bank. Faced with another showdown with Washington, Netanyahu can claim both that he is a tough-guy and that, much better than his political rivals, he knows how to navigate the intricacies of such diplomatic entanglements. He has taken on the White House on several notable occasions before and won. And by grabbing land near the Gush Etzion settlements, Netanyahu has also chosen an issue over which it will be difficult for local critics to berate him. Tzipi Livni and Yair Lapid have been the only notable voices of dissent in the cabinet, but neither is likely to threaten the coalition’s survival by resigning on this matter. Livni, who has cultivated strong ties to the Obama administration, has indicated that she supports the seizure in principle. Her opposition is over the timing, when Israel is isolated and needs US support in international forums. More significant is what the decision to seize such a large area of land reveals about Netanyahu’s attitude towards Abbas and the two-state solution, as well as his approach to the international community. According to polls, Hamas has surged in popularity among Palestinians since the ceasefire, and Netanyahu’s move will do nothing to revive Abbas’ fortunes. Israel is reported to want Abbas’ assistance in taking back whatever limited control of Gaza Israel will allow, presumably as a prelude to enforcing Hamas’ disarmament. Abbas wants Gaza too, because it will strengthen his claim to being the true representative of the Palestinian people. On paper at least, Netanyahu and Abbas should be on the same page on this issue. But the price from Abbas, as he revealed this week, is Israel’s cooperation with his newly minted peace plan, which Palestinian negotiator Saeb Erekat presented to Kerry yesterday. Reports suggest the plan will echo Kerry’s original timetable and framework for the talks that collapsed in April, with nine months for the two sides to reach an agreement. Israel would be expected to withdraw from the agreed area, based on the pre-1967 borders, within three years. However, this time Abbas will insist on no settlement building for the duration of the negotiations and there will be a tangible Palestinian threat if the process fails: unilateral moves in international forums, including pursuing war crimes trials at the International Criminal Court (ICC). Neither option – conceding Palestinian statehood, or risking war crimes trials – will appeal to Netanyahu. But if forced to make a choice, he would probably much rather call Abbas’ bluff over the ICC than allow him a state, even a demilitarised, non-sovereign one. Back in July, Netanyahu made clear his fundamental opposition to allowing the Palestinians the trappings of statehood in the West Bank. He stated that “there cannot be a situation, under any agreement, in which we relinquish security control” of the West Bank. Noting that the West Bank was 20 times the size of Gaza, he added that he was not prepared to “create another 20 Gazas”. In doing so, he effectively equated Abbas with Hamas, which in turn he has equated with the Islamic extremist group ISIS. So where does that leave Israel and Abbas? In Abbas’ case, with a few stark choices. He could mount a more forceful campaign to win statehood at the United Nations, or he could go down the ICC route. Both would lead to a serious confrontation with the United States. In Israel’s case, analysts see things going in one of two directions. One possibility is that Israel will find its isolation and pariah status growing. The comparisons with apartheid will deepen, as will the paradigm shift to a one-state solution. Early signs will be a rapid increase in various forms of boycotts, such as an imminent one from the European Union on settlement produce. The other possibility, set out by Jeff Halper, who has been studying Israel’s system of control over the occupied territories for many years, posits an even bleaker future. He believes Netanyahu may assume he can hold on to international support as he crushes all Palestinian hopes – military and diplomatic – of resistance to Israel’s complete dominance. Netanyahu, he says, may think that he can “pacify” Abbas and the Palestinians, with them coming to understand both that there is no political process and that in practice there are no countervailing forces on Israel. Halper concedes that Netanyahu may be mistaken in such assumptions, leaving himself with no exit strategy when things turn sour. Whoever is right, this week’s land grab indicates that Netanyahu is unbowed after Gaza and in no mood for making concessions.